Tests. Some pilots love them, some pilots hate them. The thing with the biennial flight review (BFR) is that it really isn’t a test, but it still feels very much like one. I just completed my first one this year, and I figured it would be a good idea to share what I learned about the process in case anyone else was feeling apprehensive about their first BFR. When is a Flight Review Required? For all certificated pilots within the United States a flight review is required at a minimum of once every 24 calendar months. Just like with other forms of currency you can do them more often than that, but as soon as the clock runs out and you slip into your 25th month since a flight review your next flight as Pilot In Command better be with a flight instructor. Additionally, there are a couple situations that can substitute for a flight review. Passing a check ride for a new certificate or rating can be substituted for a proficiency check, as well as other proficiency flights administered by a FAR 121 / 135 / 141 program. You can also satisfy the requirement by completing any phase of the FAA’s WINGS program. There are some other special cases such as for glider pilots, but in general if you’re a certificated pilot you probably need a flight review every 24 months after your last check ride. Do I Need a Flight Review for Every Category and Class? One day I’ll have the time and money to finish up my multi-engine certificate. Until then I’m stuck in single engine piston powered airplanes. So, for me, a single flight review is all that is logically required. But what if you have multiple certificates in different categories and classes? The good news is that you don’t need to schedule a different flight review for each category and class. A flight review in a single engine airplane will satisfy your currency requirements for seaplanes, multi engine aircraft, and even gliders. Is that a good idea, though? If you got your seaplane certificate back in the 80’s and have been flying gliders ever since you can technically satisfy the flight review in a glider, but that’s probably not very safe. A good idea is to get a flight review in every category and class you intend to keep current, although not required. What Is Required for a Flight Review? (2) A review of those maneuvers and procedures that, at the discretion of the person giving the review, are necessary for the pilot to demonstrate the safe exercise of the privileges of the pilot certificate. So, all that is required is one hour of ground instruction to review Part 91 rules and one hour in the air demonstrating that you aren’t a danger to yourself or others. For those thinking that this is a smaller version of the check ride, you’re right and you’re wrong at the same time. The check ride for your certificate has a very specific set of criteria that airmen must meet for certification as defined by the Airman Certification Standards. A flight review covers most of the same topics, but the standards are not hard and fast. The FAA only publishes a set of guidelines for flight instructors to follow, how they apply those standards and which specific topics are discussed are up to their discretion. Who Can Give a Flight Review? When you’re doing your check ride, only an authorized Designated Pilot Examiner or other FAA official can administer the testing. But when it comes to the flight review things aren’t quite as strict. According to the FAA, most flight instructors can perform a flight review and sign off a pilot’s logbook for another two years. There are some limitations, such as your instructor needs to be certificated to instruct for the category and class of aircraft you’re planning to use, but that’s all stuff that your flight instructor should know already and be able to advise you on. So, what should you expect? And how did mine go, for reference? Which is a significantly shorter list than what’s in the ACS. Keep in mind that this is merely a recommendation, and the instructor can change the topics based on their judgement of what you specifically should know. If you’re an instrument rated pilot, for example, I’d be surprised if your instructor doesn’t tack on some procedure questions as well. When I walked into the FBO for my flight review (after having called weeks in advance to schedule it) we headed up to a classroom on the second floor to knock out the ground portion. The flight instructor read through my logbook and asked about some of the flights, and then we started into the FAR review. For my last two check rides I took the time to get the latest version of the FAR AIM and flag the important sections, allowing me to tab through and answer any questions I didn’t know by heart. 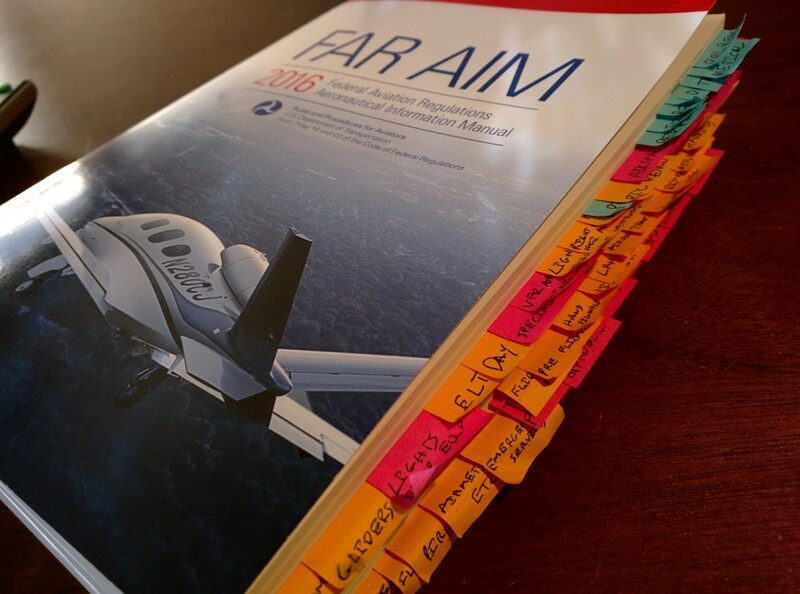 This time around I brought the same edition of the FAR AIM, still tabbed from the instrument check ride, not the updated version. I did review some of the points I thought would be asked (VFR weather minimums in different airspace) but honestly it didn’t come up much. We started with some basic map reading, which I admit I’ve gotten a touch rusty on. Then we moved on to more general flight prep and management topics. How do you figure out what the weather will look like? What are some good resources to help in making your go / no go call? And we did discuss the idea of personal weather minimums and how currency can change those positively and negatively. 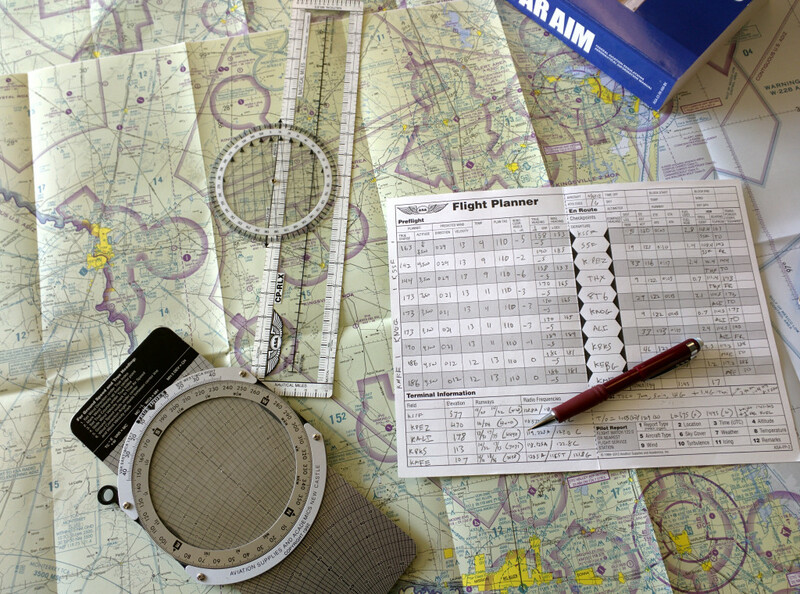 The last thing we discussed was a quick overview of an instrument approach plate. My flight instructor made it clear that we wouldn’t be doing any instrument work in the air, but it was a good review for both of us. During my first check ride I have fond memories of the DPE following my every step during the pre-flight inspection. I don’t blame him — he had never met me, and after all it was a graded portion of the ACS. This time around my flight instructor handed me the keys and told me to grab him when I was done. I appreciate that my every move wasn’t scrutinized, and I was treated more like a fellow pilot than an “applicant.” I’ve filled a good number of pages in my logbook since the last time I’ve had a check ride, so it’s not like I didn’t know what I was doing. It was also a good way to save some time, since the instructor was able to finish up the pre-flight paperwork while I wrestled the aircraft covers into the baggage compartment. How the instructor assesses those items are up to the instructor. In my case, we took off and planned a flight to a nearby non-towered airfield. Along the way the instructor asked questions about different aircraft systems, from the fuel system to how the artificial horizon functioned, all while watching to make sure that I was following the checklist. At the nearby airfield we set up for a quick touch-and-go, and the instructor’s questions became quicker and more complex. reaching my mental saturation point I asked him to hold on until after we were back in the air, which is exactly what he was looking for. He was trying to overload me and see if I would recognize the situation and take action to fix it. Speaking out to someone with more piloting experience, especially someone who is examining you (somewhat), is something that can be a life saving skill. During all the discussion I had come in too high and too fast to the airfield. I added flaps and started working on a slip to landing maneuver, but even with all the brakes I could throw at it the airplane was still nearly halfway down the field before I was in a position to put the wheels on the ground. There was still enough runway to land, but I wasn’t happy about it. I called for a go-around and firewalled the throttle. On the way back to our home base the instructor threw a couple more items at me. First we did an approach to a stall, then some slow flight, and finally some unusual attitude recovery. Back at the airfield I was expecting to be asked for a short and soft landing, but we landed normally and taxied back to the FBO. Flying complete. There are ways to avoid needing a flight review. I could have simply taken some WINGS courses and been done with it, but honestly I appreciated having a flight instructor working with me to gauge my proficiency and identify areas where I need work. 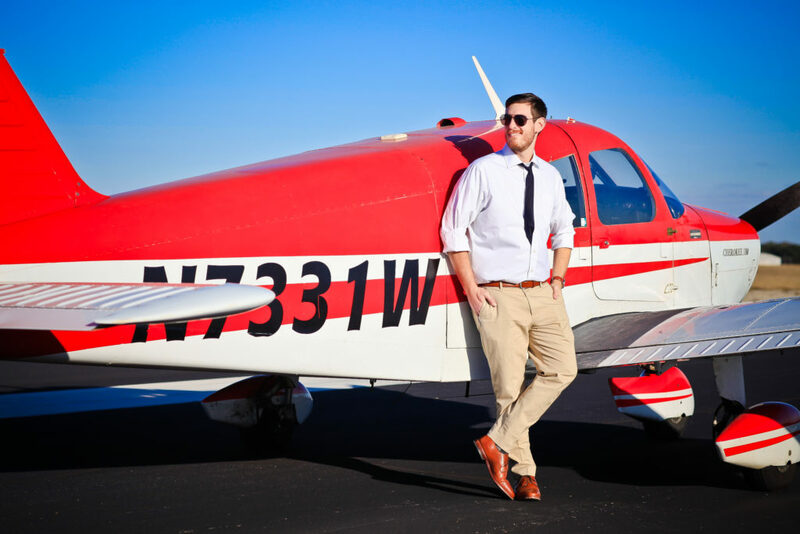 Nick Leghorn is an instrument rated private pilot (ASEL), writer, and general techy nerd living in Austin, Texas.